A fun Italian treat that's easy to make at home. Just watching the video makes my mouthwater. It's also great for giving instructions on how to make. Kudos to Cookingwithsugar.com for giving us this fantastic treat. Using a stand mixer, combine ricotta cheese, powdered sugar, white sugar and vanilla extract. Mix for a few minutes. Set the filling in a bowl and cool in refrigerator. Prepare surface with flour so dough doesn't stick. Layout pie dough and sprinkle coarse natural sugar and cinnamon over it. Push the sugar and cinnamon into the dough with a rolling pin. Cut out mini-pie crust using a 3-inch cookie cutter or the mouth of a regular cup or glass. Place each one in a muffin tin sugar-side up. Bake in oven for 10 minutes. Cup should be crispy. Let cool to touch. 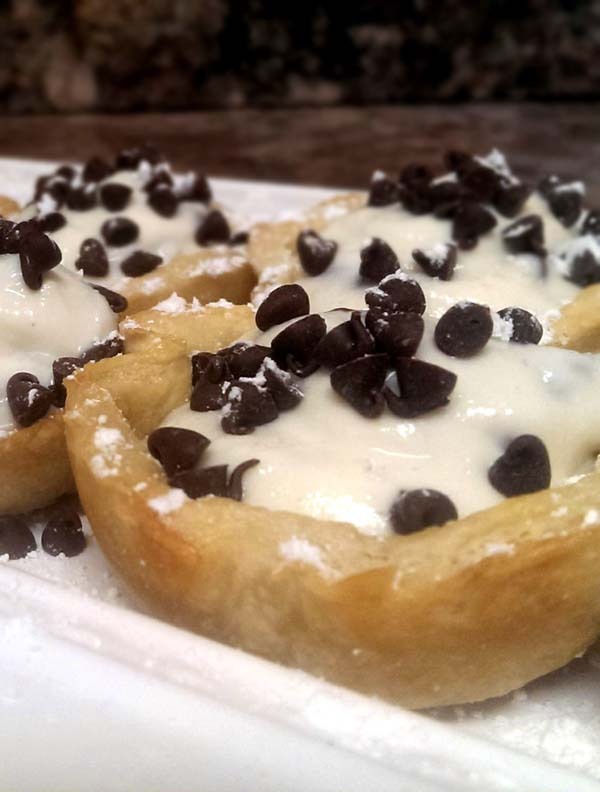 Fill each cup with filling with chocolate chips on top. Now here's the video used to make these delicious Italian desserts.